Celiac disease, triggered by wheat gliadin and related prolamins from barley and rye, is characterized by a strong association with HLA-DQ2 and HLA-DQ8 genes. Gliadin is a mixture of many proteins that makes difficult the identification of major immunodominant epitopes. To address this issue, we expressed in Escherichia coli a recombinant α-gliadin (r-α-gliadin) showing the most conserved sequence among the fraction of α-gliadins. HLA-DQ8 mice, on a gluten-free diet, were intragastrically immunized with a chymotryptic digest of r-α-gliadin along with cholera toxin as adjuvant. Spleen and mesenteric lymph node T cell responses were analyzed for in vitro proliferative assay using a panel of synthetic peptides encompassing the entire sequence of r-α-gliadin. Two immunodominant epitopes corresponding to peptide p13 (aa 120–139) and p23 (aa 220–239) were identified. The response was restricted to DQ and mediated by CD4+ T cells. In vitro tissue transglutaminase deamidation of both peptides did not increase the response; furthermore, tissue transglutaminase catalyzed extensive deamidation in vitro along the entire r-α-gliadin molecule, but failed to elicit new immunogenic determinants. Surprisingly, the analysis of the cytokine profile showed that both deamidated and native peptides induced preferentially IFN-γ secretion, despite the use of cholera toxin, a mucosal adjuvant that normally induces a Th2 response to bystander Ags. Taken together, these data suggest that, in this model of gluten hypersensitivity, deamidation is not a prerequisite for the initiation of gluten responses. Immune responses generally do not recognize all possible epitopes, but are focused on relatively few immunodominant ones. In various murine and human experimental systems, it has been reported that a large fraction of activated T cells is specific for a single epitope-MHC combination (1). Therefore, epitope-based immunodominance could represent a major issue for therapeutic or prophylactic intervention in many infective and autoimmune diseases. Celiac disease is an inflammatory disease of the small intestine with an autoimmune component (2, 3) affecting genetically susceptible individuals. A major feature of celiac disease is the inappropriate intestinal T cell activation in HLA-DQA1*05-DQB1*02 (DQ2) and HLA-DQA1*03-DQB1*0302 (DQ8) patients, triggered by peptides from wheat gliadin and related prolamins from barley and rye. Activation of innate immunity mechanisms seems to precede the initiation of gluten-specific adaptive immune response (4). To date, several gliadin epitopes have been identified (5). Most of these T cell epitopes were recognized following deamidation by the tissue transglutaminase enzyme (tTG)3; this enzyme converts some specific glutamine residues to glutamic acid (6). Moreover, DQ2-restricted T cell epitopes cluster in regions that are rich in proline residues (7); the presence of proline protects against digestive proteolysis and directs tTG-mediated deamidation on glutamine (8). However, it still remains questionable whether tTG-catalyzed deamidation of gluten is a prerequisite for the development of disease. In fact, there is strong evidence that native gluten peptides are also recognized by CD4+ T cells (9). A specific gliadin peptide has been described to be immunodominant in DQ2 adults (10). This peptide is part of an immunoactive 33-mer gliadin peptide found to be resistant to digestion by gastric and pancreatic enzymes (11). To date, only one DQ8-restricted gliadin epitope has been reported to be recognized by intestinal T cell clones from celiac disease patients (12). Interestingly, this peptide has also been found to activate the immune response in in vitro cultured intestinal biopsies from HLA-DQ8 celiac disease patients in both native and deamidated forms (13). HLA transgenic (tg) models are considered important tools to better address immunodominance of epitopes and have also been found particularly useful to identify and characterize autoantigens associated with autoimmune diseases (14). Recently, two HLA tg mice models have been developed based on the expression of HLA-DQ8 genes in the absence of their endogenous counterparts (15, 16). Results obtained showed a clear correlation between the presence of DQ8 and acquired sensitivity to gluten in both models; however, the inability to induce a small-bowel pathology suggests that further, still undetected mechanisms are involved in the genesis of the enteropathy. In this study, DQ8 mice were used to identify the immunodominant components of a recombinant α-gliadin (r-α-gliadin), whose sequence is widely conserved among the various forms of α-gliadin. To use a physiological route of Ag delivery, we orally administered the protein along with cholera toxin (CT) as mucosal adjuvant, and the response was examined by T cell proliferative assay after in vitro stimulation with a panel of synthetic peptides spanning the whole protein sequence. We found that, among the 26 peptides tested, only two were able to induce strong immune responses both in spleen and in mesenteric lymph node (MLN). The cytokine profile induced by these peptides was Th1-like, despite the use of CT, which is associated with Th2 or Th1/Th2 mixed responses. To date, this is the first study in which gliadin immunodominant epitopes were identified following oral immunization in a mouse model. The tg mice expressing the HLA-DQ8 molecule in the absence of endogenous mouse class II genes, non-tg for human CD4 (17), were maintained in pathogen-free conditions at the animal facility of the Istituto di Scienze dell’Alimentazione. Mice were reared on a gluten-free diet for several generations. Mice from this colony were used at the age of 8–14 wk. A database containing alignments of 34 α-gliadin amino acid sequences, retrieved from Swiss Prot, was developed using Megalign Lasergene System software (DNASTAR). On the basis of these data, the most conserved sequence was identified into the α-gliadin encoded by the pTS63 clone (European Molecular Biology Laboratory accession AJ130948) (18). The 714- to 1517-nt region of the DNA clone pTS63, corresponding to the mature form of the α-gliadin, was amplified by PCR using the forward primer 5′-GATCCATATGGTTAGAGTTCCAGTGC-3′ and the reverse primer 5′-GATCAAGCTTTCATTAGTTAGTACCGAAGATG-3′. These primers have been designed to introduce a NdeI site and the start codon at the 5′ end of the PCR product and two stop codons and a HindIII site at its 3′ end. Proofreading PCR was performed in a final reaction volume of 50 μl using 250 ng of digested pTS63 plasmid, 2.5 U of Pfu Turbo DNA polymerase (Stratagene), 1× cloned PFU DNA polymerase buffer (Stratagene), 40 pmol of each primer, and 0.2 mM each deoxyribonucleotide. Amplification conditions were for 29 cycles at 95°C for 1 min, 48°C for 30 s, and 72°C for 1 min, followed by a final step at 72°C for 5 min. The NdeI/HindIII-digested PCR product was cloned into the expression vector pET17xb vector (Novagen) under control of bacteriophage T7 transcription and translation signals. After transformation into Escherichia coli XL-10 ultracompetent cells according to the manufacturer’s instructions (Stratagene), the recombinant colonies were screened for the presence of the α-gliadin fragment. The resulting recombinant plasmid pMR191 was checked by sequencing and subsequently transformed into competent BL21(DE3)pLysS cells, according to the manufacturer’s instructions (Novagen). The plasmid pMR191 was expressed in this strain at 37°C. When the OD at 590 nm reached 0.6, 0.4 mM isopropyl β-d-thiogalactoside (Sigma-Aldrich) was added to the culture medium, followed by further culturing for 18 h. Harvested bacteria were washed once in 20 mM Tris-HCl (pH 8.0), resuspended in 70% ethanol, and incubated at 60°C for 2 h, according to Arentz-Hansen et al. (19). All of the purification steps thereafter were performed at 4°C. After removal of the bacteria cell debris by centrifugation, proteins were precipitated overnight by adding 2 vol of 1.5 M NaCl. The precipitate was collected by centrifugation at 14,000 × g for 30 min and washed once with n-butanol for the removal of residual bacterial lipids. The pellet was solubilized in 0.1 M Tris-HCl (pH 8.5) containing 6 M guanidinium chloride and subjected to reversed-phase HPLC (RP-HPLC) purification, as previously described (20), except that the elution step was achieved by means of a linear gradient from 30 to 60% B over 30 min. Electrospray mass spectrometry (ES/MS) analysis of the HPLC fraction was performed using a Platform single quadrupole mass spectrometer (Micromass), as previously described (20). Gliadin preparations used for administration in mice were routinely assayed for endotoxin by using the QCL-1000 reagent kit (BioWhittaker) and found to have endotoxin levels of <0.5 EU/ml. To map the dominant T cell determinants of r-α-gliadin, a set of 26 peptides, spanning the entire protein sequence, was synthesized as 20-mers by solid-phase synthesis using Fmoc chemistry on a PerSeptive Biosystems Pioneer Peptide Synthesis System GEN600611 (Applied Biosystems), using the manufacturer’s protocol; each peptide overlapped the adjacent peptides by 10 aa. Their identity and purity were assessed by means of RP-HPLC and MALDI-TOF mass spectrometry analyses. Synthetic peptides were between 92 and 95% pure. Chymotryptic digestion of r-α-gliadin was performed in 100 mM ammonium bicarbonate (pH 7.5) at 37°C for 16 h (1:100; enzyme:substrate ratio). Deamidation of 0.8 mM synthetic peptides was conducted in 0.125 M Tris-HCl (pH 8.5), containing 0.2 mg/ml guinea pig liver tTG, 1 mM calcium chloride, and 10 mM DTT. The reaction was conducted at 37°C for 4 h.
Mice were mucosally immunized by intragastric administration of 0.5 ml of PBS containing 500 μg of a chymotryptic digest of r-α-gliadin plus 25 μg of CT on days 0, 7, and 14. In some experiments, mice were immunized by intrafootpad injections into rear footpad with 50 μg of r-α-gliadin in 50 μl of distilled water emulsified in 50 μl of CFA. Mucosally immunized mice were sacrificed on day 21; MLN and spleens were harvested and passed through a stainless steel wire mesh to dissociate cells. Cells were cultured (4 × 105 cells/well) in 0.2 ml of culture medium in 96-well bottom tissue culture plates at 37°C for 96 h in the presence of 125 μg/ml r-α-gliadin or 50 μM peptides. Sixteen hours before harvesting, cultures were pulsed with 1 μCi/well [3H]thymidine. Results were expressed as stimulation index (mean cpm of triplicate cultures containing Ag)/(mean cpm of cells cultured with medium alone). In some experiments, CD4+ cells were purified by magnetic cell sorting using CD4+ (L3T4) microbeads, according to the manufacturer’s instructions (Miltenyi Biotec); cell yield was assessed by FACS analysis. A total of 2 × 105 purified CD4+ cells was incubated with 4 × 105 irradiated syngenic spleen cells as APC in the presence of Ag, as described above. Parenterally immunized mice were sacrificed on day 10 to collect popliteal lymph node cells for proliferation assay, as described above. CD4+ T cells were cultured at 2.5 × 106 cells/ml in the presence of APC (5 × 106 cells/ml) and subjected to one to three rounds of Ag stimulation in vitro; after 72 h following each Ag incubation, supernatants were collected and analyzed for IFN-γ, IL-4, and IL-10 protein levels by ELISA. The staining of cell markers was performed on ice. All conjugated Abs were purchased from BD Discovery Labware. After preincubation for 5 min with Fc block to avoid nonspecific binding, 2 × 105 cells were stained for 20 min with FITC-conjugated anti-DQ, FITC-conjugated anti-mouse CD3, FITC-conjugated anti-mouse MHC class II, PE-Cy5-conjugated anti-mouse CD4, or PE-conjugated anti-mouse CD8. For dendritic cell staining, cells were incubated with biotinylated anti-CD11c; after washing, cells were incubated for 20 min with streptavidin-conjugated R-PE. Cells were analyzed by flow cytometry using a FACSCalibur and CellQuest software (BD Biosciences). An isotype control of appropriate subclass was used for each specific Ab. Native gliadin is a mixture of many components (21) showing variability in inducing immune responses (22). This heterogeneity makes difficult the identification of immunodominant epitopes. To overcome this issue, we focused our attention on the “a” component of this mixture and, particularly, on the most conserved sequence among all the α-gliadins found in the European Molecular Biology Laboratory Nucleotide Sequence Database. A total of 34 entries was examined by using a protein alignment software to derive a consensus sequence. Swiss Prot entry Q9ZP09 (Fig. 1⇓A) was the closest in identity (99%) to the consensus sequence with only two mismatches (K→N; T→A). The cDNA sequence, encoding for the mature form of the identified protein (European Molecular Biology Laboratory accession AJ130948), was then amplified from plasmid pTS63 (18) and subcloned in E. coli, as described in Materials and Methods. The HPLC profile obtained from the purified protein exhibited a major sharp peak (Fig. 1⇓B). The ES/MS analysis showed the presence of two components with molecular masses of 31,286 ± 1.6 Da and 31,151 ± 1.5 Da, corresponding to the expected molecular mass of the r-α-gliadin with and without the methionine residue at the N terminus (Fig. 1⇓C). These data confirmed the purity and the primary structure of the expressed product. Next, the immune cross-reactivity between wheat gliadin and r-α-gliadin was analyzed in terms of cell-mediated response. Draining lymph node cells from mouse systemically immunized with r-α-gliadin showed a significant proliferation when challenged in vitro with wheat gliadin (Fig. 1⇓D), suggesting that the recombinant molecule can be processed as its native counterpart. This preparation was used for all subsequent experiments. Production and characterization of r-α-gliadin. A, Sequence of α-gliadin (Swiss Prot accession Q9ZP09). B, RP-HPLC profile of purified r-α-gliadin showing a major sharp peak. C, ES/MS analysis of the HPLC fraction: mass values of the peaks correspond to m.w. of r-α-gliadin without (1) or with (2) a N-terminal methionine residue. D, Proliferative responses by lymph node cells from mice parenterally immunized with r-α-gliadin; the analysis was performed by using 200 μg/ml r-α-gliadin or wheat gliadin as Ags in vitro. To map the dominant T cell determinants in the r-α-gliadin, a set of 26 peptides, spanning the entire protein sequence, was synthesized as 20-mers. Each peptide is overlapping the adjacent ones by 10 aa. The peptides were analyzed by MALDI-TOF mass spectrometry before and after tTG treatment, as previously described (23), and their sequences are reported in Table I⇓. Peptides p10, p14, p16, p17, p18, p24, p25, and p26 were devoid of any deamidation, while peptides p11 and p12 were insoluble in the buffer used for the enzymatic treatment and hence were not further analyzed. Our results are in accordance with previous data (23); moreover, the deamidation site in p13, not previously identified (23), was finally assigned to Q123. FACS analysis showed that the DQ8 molecule was expressed both at the systemic (spleen) and intestinal (MLN) level in tg mice and, most important, on dendritic cells in both compartments (Fig. 2⇓), giving the opportunity to analyze the intestinal cellular immune response to r-α-gliadin. By comparison, the expression levels of DQ8 in a human lymphoblastoid DR4-DQ8 cell line and MHC class II in spleen cells from BALB/c mice were also assessed (Fig. 2⇓). Although DQ8 expression was higher in the human lymphoblastoid cell line than in murine cells, the MHC II molecules were expressed at comparable levels in spleen cells from DQ8 tg mice and BALB/c mice. Surface expression of DQ8 heterodimer on spleen and MLN cells. Cells were isolated from spleen and MLN of DQ8 tg mice, stained for DQ and CD11c, and analyzed by FACS. Isotype controls were used to set background (gray area). The expression was analyzed on whole cells or on the CD11c+-gated cells. FACS analyses were also performed on spleen cells from BALB/c mice and on a human DR4-DQ8 homozygous EBV-transformed B-lymphoblastoid cell line, to compare the expression levels of mouse class II and DQ8 molecules, respectively. Mice were intragastrically immunized with a r-α-gliadin chymotryptic digest along with CT as mucosal adjuvant, as described in Materials and Methods. This immunization strategy induced a significant gliadin-specific immune response both in spleen (Fig. 3⇓A) and MLN (Fig. 4⇓A). The cells were stimulated in vitro with each individual peptide of the panel to identify the amino acid sequences responsible for the immune response. We found that only peptides p13 and p23 and their corresponding deamidated forms induced significant in vitro proliferation of spleen (Fig. 3⇓) and MLN cells (Fig. 4⇓). Epitope mapping of synthetic gliadin peptides in spleen. Following oral immunization with a chymotryptic digest of r-α-gliadin along with CT, spleen cells were isolated and incubated in vitro with native (A) or deamidated peptides (B). The bars represent the proliferative response, expressed as stimulation index, from the mean ± SD of triplicate cultures and are representative of seven independent experiments. Asterisks indicate responses that differ significantly (∗, p < 0.05; ∗∗, p < 0.001) using Student’s t test. Epitope mapping of overlapping synthetic gliadin peptides in MLN. Following oral immunization with a chymotryptic digest of r-α-gliadin along with CT, MLN cells were isolated and incubated in vitro with native (A) or deamidated peptides (B). The bars represent the proliferative response, expressed as stimulation index, from the mean ± SD of triplicate cultures and are representative of six independent experiments. Asterisks indicate responses that differ significantly (∗, p < 0.05; ∗∗, p < 0.001) using Student’s t test. 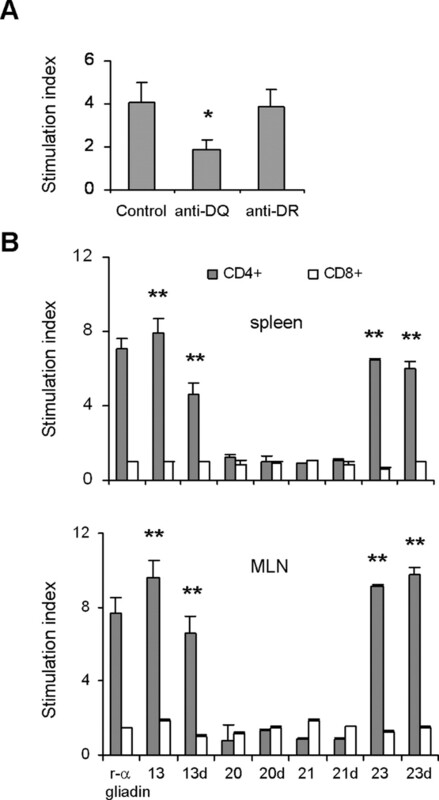 To assess the restriction of the response to r-α-gliadin, spleen cells from immunized mice were analyzed by in vitro blocking experiments in the presence of anti-DQ or anti-DR Abs. As expected, we found that the response to gliadin was almost completely inhibited by anti-DQ, but not anti-DR Abs (Fig. 5⇓A). Similar results were found for MLN cells (data not shown). Restriction of the gliadin-specific proliferative response. A, Spleen cells were incubated in the presence of anti-DQ or anti-DR Abs and Ag; control is spleen cells incubated in the absence of Abs. B, CD4+ and CD8+ cells were isolated from spleen and MLN by immunomagnetic sorting and incubated with responder peptides in native or deamidated forms; as negative control p20, p20d, p21, and p21d were also analyzed. The bars represent the proliferative response, expressed as stimulation index from the mean ± SD of triplicate cultures, and are representative of four independent experiments. Asterisks indicate responses that differ significantly (∗, p < 0.05; ∗∗, p < 0.001) using Student’s t test. We further analyzed the response to p13 and p23 peptides and their deamidated forms in the purified CD4+ and CD8+ T cell subpopulations. Peptides p20, p20d, p21, and p21d were used as negative controls. As shown in Fig. 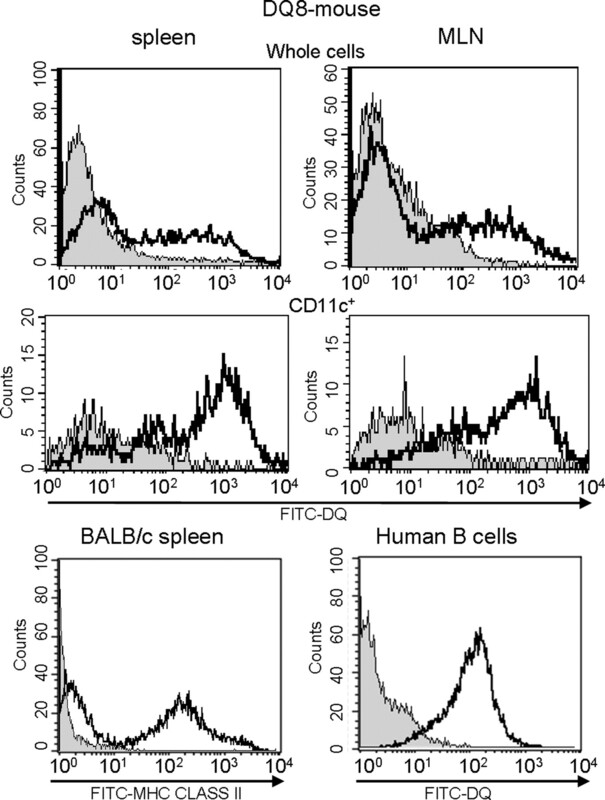 5⇑B, CD4+ T cells in both compartments exclusively mediated lymphocyte proliferation. Interestingly, the in vitro tTG-mediated deamidation of p13 and p23 did not significantly modify the amplitude of the specific immune response. Peptide p13 includes the r-α-gliadin peptide p123–132 (QLIPCMDVVL), previously reported to be selectively recognized by HLA-A*0201-restricted CD8+ lymphocytes isolated from celiac disease patients (24). To address whether the same sequence was also responsible for the DQ8-restricted immune response of p13, we evaluated the ability of p123–132 to stimulate proliferation of CD4+ spleen cells in comparison with p13 and its deamidated form. As shown in Fig. 6⇓, the p123–132 peptide failed to induce a strong T cell proliferation of CD4+ spleen cells. Similar results were obtained for CD4+ MLN cells (data not shown). Response of CD4+ spleen cells to an HLA-A2-restricted epitope included in p13. Spleen cells were incubated in the presence of r-α-gliadin, p13, p13d, or A gliadin p123–132 peptide (24 ). Data represent mean ± SD of triplicate cultures and are representative of two independent experiments. ∗∗, p < 0.001. Inset, Suggested binding register of newly identified immunodominant gliadin peptides to DQ8 anchor positions. For comparative purposes, the sequences of A gliadin p123–132 and gliadin peptide p206–217 (27 ) were also reported. It has been shown that DQ8 peptide-binding motif has preferentially an acidic or highly polar residue that fits the P1 pocket and an acidic residue the P9 (25, 26). In accordance with these findings and, on the basis of the above reported proliferation assays, we speculated that p13 residues Q122 and D130 fit respectively in P1 and P9 pockets of DQ8, as shown in the inset of Fig. 6⇑. This model can explain both our observations, i.e., the failure of p123–132 in inducing a response and a quite similar immune response of p13 in both native and deamidated form (Fig. 5⇑). In fact, p13 tTG treatment deamidates Q123, but not Q122 (Table I⇑), indicating that no amino acidic substitution occurs at P1 pocket. Similarly, gliadin residues Q227 and E235 of p23 could allocate in P1 and P9 pockets, respectively. 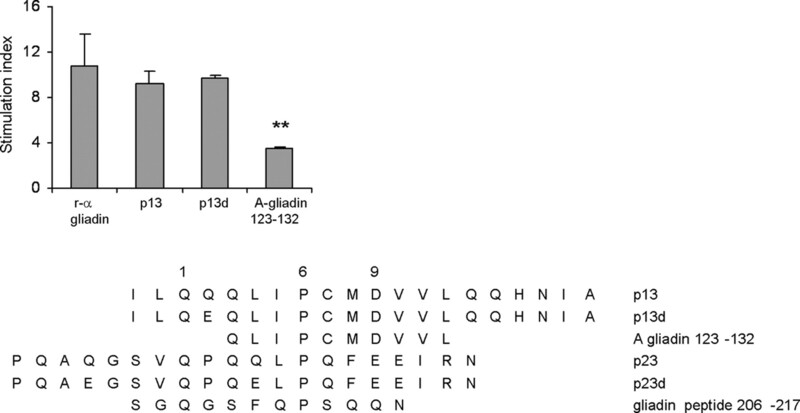 A comparative alignment for gliadin peptide 207–213 (27) is presented in the inset of Fig. 6⇑. Interestingly, all of the three examined peptides (p13, p23, peptide 206–217) showed a proline residue that could be allocated in the P6 pocket; no other similar sequences were identified all along the r-α-gliadin. To study the pattern of cytokine induction, DQ8 tg mice were immunized with r-α-gliadin and CD4+ T cells were in vitro cultured with both r-α-gliadin and the immunodominant peptides p13 and p23. The cell culture supernatants were analyzed by quantitative ELISA for IFN-γ, IL-4, and IL-10 production. As shown in Fig. 7⇓, following first stimulation with r-α-gliadin, p13, or p23, spleen CD4+ T cells secreted significant levels of IFN-γ and not of IL-4 or IL-10; however, these cytokines were undetectable in MLN CD4+ T cells. After a second round of in vitro Ag stimulation, MLN CD4+ T cells also showed a measurable response, characterized by production of both IFN-γ and IL-4. Interestingly, after three rounds of Ag stimulation, the peptide-specific T cell responses were characterized by a predominant IFN-γ secretion in both compartments, whereas r-α-gliadin-derived T cells showed increased expression of IL-4 and IL-10. Cytokine production. CD4+ cells, isolated from the spleen and MLN of mice orally immunized with a chymotryptic digest of r-α-gliadin plus CT, were tested for cytokine production after one, two, or three rounds of Ag stimulation in vitro. Data, expressed as picograms per milliliter, represent mean ± SD of triplicate cultures and are representative of three independent experiments. Gliadin, which has been considered responsible for inducing celiac disease (28), is a mixture of many proteins (21), with marked differences in stimulating murine T cell proliferative responses (22). The gliadin fraction has been grouped in three classes named “α,” “γ,” and “ω” based on biochemical analysis that revealed a tight structural relationship among the various constituents (29). Our previous studies also showed that purified α-gliadin is able to down-regulate the systemic immune response after a challenge with the whole gliadin fraction (20), suggesting a strong immune cross-reactivity among the different classes. Based on these observations, we focused our attention on the “α” component of gliadin. Upon database searches, it was not possible to retrieve a fully conserved consensus sequence among all of the 34 entries of α-gliadins; as a consequence, we considered the most conserved entry, Q9ZP09, representing an α-gliadin from spelt wheat (18). This protein includes sequence LGQQQPFPPQQPY corresponding to peptide p31–43, previously recognized to induce damage both in vitro (30) and in vivo in celiac disease (31), and sequence LQLQPFPQPQLP of the DQ2-restricted α9 peptide p57–68. However, it does not contain DQ2-restricted α2 peptide p62–75 (FPQPQLPYPQPQLP) (32) or the multivalent 33-mer peptide p57–89 (LQLQPFPQPQLPYPQPQLPYPQPQLPYPQPQPF) (11).The sequence SGQGSFQPSQQN of the gliadin peptide p206–217, previously found to be recognized by T cells isolated from DQ8 patients (12), with two substitutions (L206→S and R212→Q), is also found in this protein. Wheat gliadin-stimulated responses in r-α-gliadin-primed mice, as shown by proliferation assays, indicated the existence not only of marked structural homologies between native and recombinant proteins, but also of similarities in the processing steps followed by APC. Our previous findings on induction of systemic tolerance toward wheat gliadin following nasal administration of r-α-gliadin (33) further strengthened this concept. Genetics plays a key role in the pathogenesis of celiac disease. In particular, alleles that code for HLA-DQ2 or HLA-DQ8 heterodimers are present in virtually all patients with celiac disease (3). Interestingly, it has been reported that expression of the human heterodimer DQ8 in tg mice confers sensitivity to gluten, providing a powerful model system to study some aspects of celiac disease (15). However, the presence of the HLA-DQ8 molecule was not sufficient to develop enteropathy in this model; this may be due to the lack of other still unknown genetic and environmental factors, but also the consequence of exposure to gluten of not sufficient duration to induce appreciable damage (15). The importance of DQ8 expression to contribute sensitivity to gluten has been subsequently confirmed in DQ8 tg NOD mice that, following gluten immunization, developed a blistering disease similar to the human, gluten-sensitive, dermatitis herpetiformis (16). In the present work, DQ8 tg mice were used for the first time to explore intestinal T cell responses to gliadin. To promote these responses, mice were challenged with intragastric injections of r-α-gliadin along with CT as adjuvant. Intragastric administration gave us the advantage of generating HLA-restricted cell-mediated responses to naturally occurring epitopes not only in the systemic (spleen), but also in the intestinal (MLN) compartment. However, it must be underlined that these mice are not tg for human CD4. As this molecule has greater affinity for human MHC II molecules than its mouse counterpart, that can explain the low stimulation indices reported in this study. Therefore, two novel DQ8-restricted gliadin peptides, p13 (ILQQQLIPCMDVVLQQHNIA; aa 120–139) and p23 (PQAQGSVQPQQLPQFEEIRN; aa 220–239), were identified. It has been shown that lymph node cells from HCD4/DQ8 tg mice respond predominantly to peptides corresponding to peptides p1 and p2 of Table I⇑ (15) (K. E. Black, unpublished observation). In the present study, these sequences were unable to elicit any response. However, discrepancies in the results can easily be explained by the use of different strategies of immunization (parenteral vs enteral), type of immunogen (peptide vs protein), and adjuvants (CFA vs CT). Furthermore, as differences between mouse and human TCR genes exist, our findings need to be confirmed in humans, and work is in progress to address this issue. In contrast, examples in which the human MHC II allelic transgene presents in mouse the very same sequences described in humans are encouraging (34, 35). As stated before, a modified version of the previously identified DQ8-restricted stimulatory peptide p206–217 (27) contained in the peptide p21 was found to be nonimmunogenic. Nevertheless, the same authors reported that any substitution in the central part of the core peptide (residues 209–215) completely abolished T cell recognition (27). Consequently, we suggest that the substitution R212→Q could explain the lack of immunogenicity of p21, observed in DQ8 tg mice. Interestingly, the immunodominant peptide p13 also contained a CD8+ HLA-A2-restricted epitope (24). Analysis of the CD4+-mediated proliferative responses clearly showed that the two epitopes were not completely overlapping. The existence of CD4+ and CD8+ T cell-nested epitopes has been described for a series of pathologic conditions (36, 37). However, this is the first study demonstrating in gliadin the presence of CD4+- and CD8+-binding epitopes in a nested configuration. This finding suggests that the same professional APC can simultaneously process and present both epitopes, enhancing the efficiency of the specific immune response. Thus, the function of p13 remains to be better investigated in celiac disease patients. It has been reported that gliadin antigenicity is increased following in vitro deamidation of glutamine residues to glutamic acid by tTG (6). Interestingly, tTG catalyzed extensive deamidation in vitro all along the r-α-gliadin molecule (see Table I⇑ and Ref.23), but failed to elicit new immunogenic determinants. Moreover, tTG treatment did not further increase p13 and p23 activities in our model. tTG is believed to have a role in the pathogenesis of celiac disease; in particular, its activity is required for enhancing the gluten-specific responses of T cells derived from celiac disease patients (6, 19, 32). As HLA-DQ2 and HLA-DQ8 showed a preference for negative charges at specific anchor positions, tTG-mediated deamidation of glutamine residues creates more negative charges in gluten peptides, thus increasing their binding efficiency (38, 39). Recently, intestinal histamine-gluten peptide complexes have been suggested as possible source for releasing such deamidated immunogenic peptides in celiac disease (40). However, it has been shown that celiac disease patients can also recognize natural fragments of gliadin (12, 41). Most important, an extensive investigation in children with recent onset celiac disease provided evidence of both deamidation-dependent and -independent responses to gluten peptides in T cells of most examined patients (9). Altogether, these findings strongly suggest that deamidation is not a prerequisite for the initiation of gluten responses. It must be emphasized that, in the present study, we used DQ8 tg mice reared on a gluten-free diet, and hence never exposed to the Ag before immunization. Thus, our murine model mimics more closely the condition observed at the onset of the disease, rather than overt celiac disease. A binding motif for the HLA-DQ8 molecule has been described by using a combination of computational sequencing data, in vitro binding assays (42, 43), and x-ray crystallography (26). The motif consists of five anchor regions. P1 and P9 anchors require negative or polar residues, with aliphatic/aromatic, neutral residues at P4; small aliphatic amino acids at P6; and any residue at P7. In particular, the dominant specificity for acidic residues in position 9 has been definitively supported by x-ray crystallographic studies (26). Interestingly, both p13 and p23 peptides harbor an acidic residue that can be allocated in P9. Based on these data and considering the previously described structural analysis of the DQ8-gliadin peptide p206–217 (SGQGSFQPSQQN) (27), we conducted a comparative analysis of p13, p23, and p206–217 peptides (Fig. 6⇑, inset). All of the three sequences showed a glutamine at P1 and a proline at P6. In the latter pocket, bulky hydrophobic or basic residues are not permitted and acidic residues are not well tolerated (44). The presence of a proline residue at P6 could be crucial to maintain the correct conformation of the peptide in the binding groove. Our hypotheses are also sustained by the findings that no other sequences showing this particular combination of residues were present all along the r-α-gliadin. Moreover, the recently identified HLA-A2-restricted gliadin peptide p123–132 (24), whose sequence represents a truncated version of our proposed binding motif for p13 (see inset in Fig. 6⇑), also failed to stimulate CD4+ T cells. Studies aimed at the identification of the minimal core regions of the stimulatory gliadin p13 and p23 peptides are ongoing in our lab. It is known that the type of adjuvant and route of administration influence the immune response. In particular, mucosal coimmunization with CT predominantly enhances Th2 responses to coadministered Ag (45, 46). Instead, the results reported in this work are indicative of a powerful Th1 cellular response in spleen, following in vitro r-α-gliadin stimulation. This characteristic was lost after subsequent rounds of in vitro stimulation, when the response was consistently Th2 in both the examined compartments. The in vitro polarization of the immune response has already been described and related to a possible immunosuppressive function of T cells generated by immunization with an Ag along with CT (46). These data suggest that gliadin-specific Th2/T regulatory T cells are involved in the progressive in vitro suppression of Th1 T cells. It is intriguing to note that both the immunodominant peptides induced predominantly IFN-γ secretion in vitro, as expected in the Th1-like response in celiac disease (47). This result can be explained by the selective in vitro expansion of T cells that recognize p13 and p23 peptides, in the absence of a regulative Th2/T regulatory activity driven by other gliadin peptides. Further studies are needed to better address this issue. In conclusion, our findings showed that only two immunodominant nondeamidated peptides from r-α-gliadin could be identified in sensitized DQ8 tg mice. These peptides were able to elicit potent CD4+-mediated Th1 responses. Clearly, the strategy of using a single gliadin molecule, instead of the whole gliadin mixture, could underestimate the real number of epitopes, but this result can be justified by assuming the existence of epitope spreading. We suggest that progression of the disease can be seen as a two-step process: in an early phase, the immune response is directed toward a few natural peptides encompassing, among other crucial residues, a glutamic or aspartic acid, useful for optimal binding to DQ8/DQ2. Subsequently, in situ tTG-mediated deamidation could create new binding sites to the DQ8/DQ2 heterodimer, thus triggering the production of novel and, perhaps, more immunogenic epitopes. Epitope spreading has been demonstrated in a number of animal models of autoimmunity (48, 49, 50) and suggested to be involved in the pathogenesis of human autoimmune diseases (51, 52). The finding that only two peptides may be responsible for initiating DQ8-restricted T cell reactivity represents a key step toward providing reagents for possible interventions in celiac disease. Several approaches could be envisaged to block induction of gluten intolerance by using these peptides. The administration of nonstimulatory analogues that are still able to compete for binding to HLA molecules is one possibility. An alternative strategy is represented by the administration of immunodominant peptides as tolerogens. As the classical approach to induce tolerance, i.e., Ag feeding, is not applicable in celiac disease, alternative forms of induction of mucosal tolerance are mandatory. From this perspective, the nasal-associated lymphoid tissue (NALT), the inductive site of the upper respiratory airway in mice, is a possible candidate. In fact, NALT has been shown to be a potent inductive site not only for respiratory, but also for other distant mucosal districts, including gut (53). In addition, NALT has been shown to be involved in the generation of tolerance (54). Moreover, we have already found that intranasal administration of gliadin in mice can down-regulate the systemic immune response to this Ag (20, 55). Finally, r-α-gliadin induced a similar down-regulatory effect in DQ8 tg mice immunized with a commercial preparation of wheat gliadin (33). Hence, the identification of immunodominant epitopes of this molecule can be seen as a further step toward the definition of safer tolerogenic molecules to be administered in patients with celiac disease for blocking the onset of the disease. We thank Dr. Renato D’Ovidio (Università della Tuscia, Viterbo, Italy) for the generous gift of the clone pTS63, and Dr. Luigi Longobardo (University “Federico II” of Naples, Naples, Italy) for assistance in the preparation of synthetic peptides. We also thank Dr. Prafullakumar Tailor and Dr. Sunil Gangadharan (National Institute of Child Health and Human Development, National Institutes of Health, Bethesda, MD) for careful reading of the manuscript. ↵1 This study was supported by Progetti di Ricerca di Interesse Nazionale funds from the Italian Ministry of Education and Research. ↵3 Abbreviations used in this paper: tTG, tissue transglutaminase; CT, cholera toxin; ES/MS, electrospray mass spectrometry; MLN, mesenteric lymph node; NALT, nasal-associated lymphoid tissue; r-α-gliadin, recombinant α-gliadin; RP-HPLC, reversed-phase HPLC; tg, transgenic. Sette, A., L. Fikes. 2003. Epitope-based vaccines: an update on epitope identification, vaccine design and delivery. Curr. Opin. Immunol. 15: 461-470. Maki, M., P. Collin. 1997. Coeliac disease. Lancet 349: 1755-1759. Kagnoff, M. F.. 2005. Overview and pathogenesis of celiac disease. Gastroenterology 128: S10-S18. Maiuri, L., C. Ciacci, I. Ricciardelli, L. Vacca, V. Raia, S. Auricchio, J. Picard, M. Osman, S. Quaratino, M. Londei. 2003. Association between innate response to gliadin and activation of pathogenic T cells in coeliac disease. Lancet 362: 30-37. Vader, L. W., A. de Ru, Y. van der Wal, Y. M. C. Kooy, W. Benckhuijsen, M. L. Merin, J. W. Wouter Drijfhout, P. van Veelen, F. Koning. 2002. Specificity of tissue transglutaminase explains cereal toxicity in celiac disease. J. Exp. Med. 195: 643-649. Molberg, O., S. N. McAdam, R. Korner, H. Quarsten, C. Kristiansen, L. Madsen, L. Fugger, H. Scott, O. Noren, P. Roepstorff, et al 1998. Tissue transglutaminase selectively modifies gliadin peptides that are recognized by gut-derived T cells in celiac disease. Nat. Med. 4: 713-717. Arentz-Hansen, H., S. N. McAdam, O. Molberg, B. Fleckenstein, K. E. Lundin, T. J. Jorgensen, G. Jung, P. Roepstorff, L. M. Sollid. 2002. Celiac lesion T cells recognize epitopes that cluster in regions of gliadins rich in proline residues. Gastroenterology 123: 803-809. Hausch, F., L. Shan, N. A. Santiago, G. M. Gray, C. Khosla. 2002. Intestinal digestive resistance of immunodominant gliadin peptides. Am. J. Physiol. Gastrointest. Liver Physiol. 283: G996-G1003. Vader, W., Y. Kooy, P. Van Veelen, A. De Ru, D. Harris, W. Benckhuijsen, S. Pena, L. Mearin, J. W. Drijfhout, F. Koning. 2002. The gluten response in children with celiac disease is directed toward multiple gliadin and glutenin peptides. Gastroenterology 122: 1729-1737. Anderson, R. P., P. Degano, A. J. Godkin, D. P. Jewell, A. V. Hill. 2000. In vivo antigen challenge in celiac disease identifies a single transglutaminase-modified peptide as the dominant A-gliadin T-cell epitope. Nat. Med. 6: 337-342. Van de Wal, Y., Y. M. Kooy, P. A. van Veelen, S. A. Pena, L. M. Mearin, O. Molberg, K. E. Lundin, L. M. Sollid, T. Mutis, W. E. Benckhuijsen, et al 1998. Small intestinal T cells of celiac disease patients recognize a natural pepsin fragment of gliadin. Proc. Natl. Acad. Sci. USA 95: 10050-10054. Mazzarella, G., M. Maglio, F. Paparo, G. Nardone, R. Stefanile, L. Greco, Y. van de Wal, Y. Kooy, F. Koning, S. Auricchio, R. Troncone. 2003. An immunodominant DQ8 restricted gliadin peptide activates small intestinal immune response in in vitro cultured mucosa from HLA-DQ8 positive but not HLA-DQ8 negative coeliac patients. Gut 52: 57-62. Abraham, R. S., C. S. David. 2000. 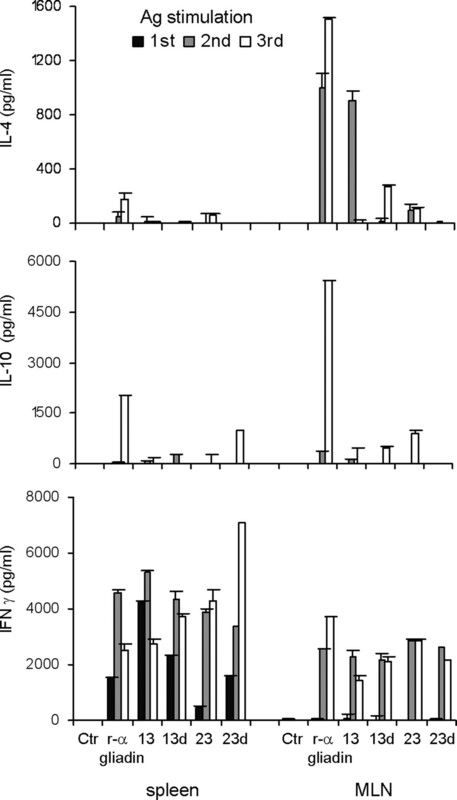 Identification of HLA-class-II-restricted epitopes of autoantigens in transgenic mice. Curr. Opin. Immunol. 12: 122-129. Black, K. E., J. A. Murray, C. S. David. 2002. HLA-DQ determines the response to exogenous wheat proteins: a model of gluten sensitivity in transgenic knockout mice. J. Immunol. 169: 5595-5600. Marietta, E., K. Black, M. Camilleri, P. Krause, R. S. Rogers, III, C. David, M. R. Pittelkow, J. A. Murray. 2004. A new model for dermatitis herpetiformis that uses HLA-DQ8 transgenic NOD mice. J. Clin. Invest. 114: 1090-1097. Cheng, S., J. Baisch, C. Krco, S. Savarirayan, J. Hanson, K. Hodgson, M. Smart, C. David. 1996. Expression and function of HLA-DQ8 (DQA1*0301/DQB1*0302) genes in transgenic mice. Eur. J. Immunogenet. 23: 15-20. Kasarda, D. D., R. D’Ovidio. 1999. Deduced amino acid sequence of an α gliadin gene from spelt wheat (Spelta) includes sequences active in celiac disease. Cereal. Chem. 76: 548-551. Arentz-Hansen, E. H., S. N. McAdam, O. Molberg, C. Kristiansen, L. M. Sollid. 2000. Production of a panel of recombinant gliadins for the characterization of T cell reactivity in coeliac disease. Gut 46: 46-51. Maurano, F., R. A. Siciliano, B. De Giulio, D. Luongo, M. F. Mazzeo, R. Troncone, S. Auricchio, M. Rossi. 2001. Intranasal administration of one α gliadin can down-regulate the immune response to whole gliadin in mice. Scand. J. Immunol. 53: 290-295. Platt, S. G., D. D. Kasarda. 1971. Separation and characterization of gliadin fractions. Biochim. Biophys. Acta. 243: 407-415. Kagnoff, M. F., R. K. Austin, H. C. L. Johnson, J. E. Bernardin, M. D. Dietler, D. D. Kasarda. 1982. Coeliac sprue: correlation with murine T cell responses to wheat gliadin components. J. Immunol. 129: 2693-2697. Mazzeo, M. F., B. De Giulio, S. Senger, M. Rossi, A. Malorni, R. A. Siciliano. 2003. 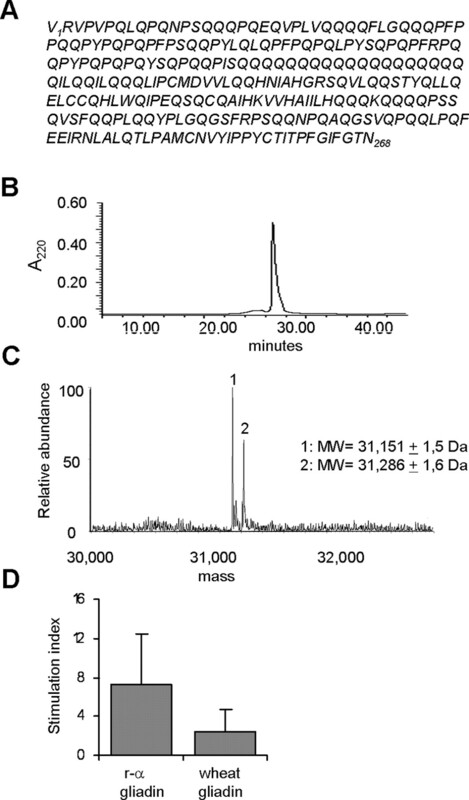 Identification of transglutaminase-mediated deamidation sites in a recombinant α-gliadin by advanced mass-spectrometric methodologies. Protein Sci. 12: 2434-2442. Gianfrani, C., R. Troncone, P. Mugione, E. Cosentini, M. De Pascale, C. Faruolo, S. Senger, G. Terrazzano, S. Southwood, S. Auricchio, A. Sette. 2003. Celiac disease association with CD8+ T cell responses: identification of a novel gliadin-derived HLA-A2-restricted epitope. J. Immunol. 170: 2719-2726. Kwok, W. W., G. T. Nepom, F. C. Raymond. 1995. HLA-DQ polymorphisms are highly selective for peptide binding interactions. J. Immunol. 155: 2468-2476. Lee, K. H., K. W. Wucherpfennig, D. C. Wiley. 2001. Structure of a human insulin peptide-HLA-DQ8 complex and susceptibility to type 1 diabetes. Nat. Immunol. 2: 501-507. Moustakas, A. K., Y. van de Wal, J. Routsias, Y. M. Kooy, P. van Veelen, J. W. Drijfhout, F. Koning, G. K. Papadopoulos. 2000. Structure of celiac disease-associated HLA-DQ8 and non-associated HLA-DQ9 alleles in complex with two disease-specific epitopes. Int. Immunol. 12: 1157-1166. Trier, J. S.. 1991. Celiac sprue. N. Engl. J. Med. 325: 1709-1719. Wieser, H., A. Mödl, W. Seilmeier, H. D. Belitz. 1987. 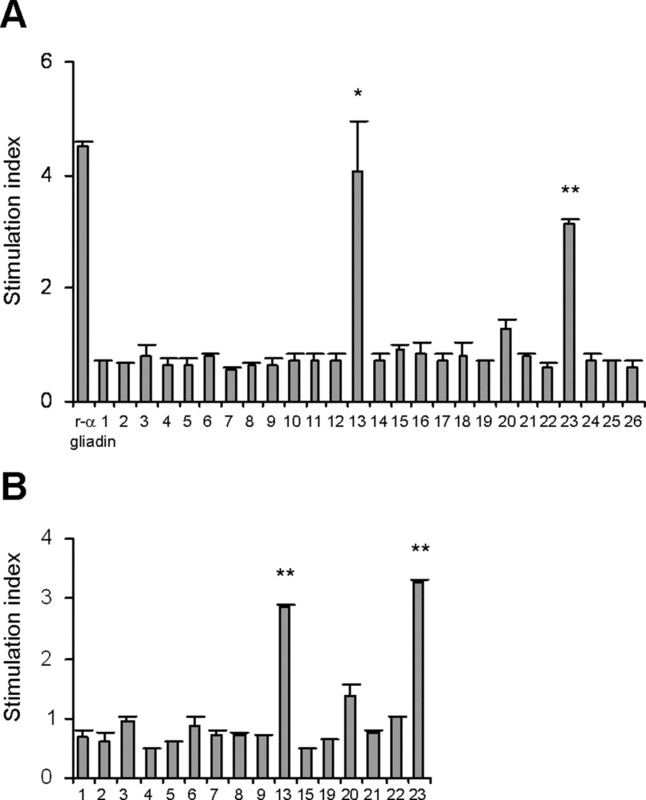 High-performance liquid chromatography of gliadins from different wheat varieties: amino acid composition and N-terminal amino acid sequence of components. Z. Lebens. Unters. Forsch. 185: 371-378. De Ritis, G., S. Auricchio, H. W. Jones, E. J. Lew, J. E. Bernardin, D. D. Kasarda. 1988. In vitro (organ culture) studies of the toxicity of specific A- gliadin peptides in celiac disease. Gastroenterology 94: 41-49. Sturgess, R., P. Day, H. J. Ellis, K. E. Lundin, H. A. Gjertsen, M. Kontakou, P. J. Ciclitira. 1994. Wheat peptide challenge in coeliac disease. Lancet 343: 758-761. Arentz-Hansen, H., R. Korner, O. Molberg, H. Quarsten, W. Vader, Y. M. Kooy, K. E. Lundin, F. Koning, P. Roepstorff, L. M. Sollid, S. N. McAdam. 2000. The intestinal T cell response to α-gliadin in adult celiac disease is focused on a single deamidated glutamine targeted by tissue transglutaminase. J. Exp. Med. 191: 603-612. Senger, S., D. Luongo, F. Maurano, M. F. Mazzeo, R. A. Siciliano, C. Gianfrani, C. David, R. Troncone, S. Auricchio, M. Rossi. 2003. Intranasal administration of a recombinant α-gliadin down-regulates the immune response to wheat gliadin in DQ8 transgenic mice. Immunol. Lett. 88: 127-134. Geluk, A., V. Taneja, K. E. van Meijgaarden, E. Zanelli, C. Abou-Zeid, J. E. Thole, R. R. de Vries, C. S. David, T. H. Ottenhoff. 1998. Identification of HLA class II-restricted determinants of Mycobacterium tuberculosis-derived proteins by using HLA-transgenic, class II-deficient mice. Proc. Natl. Acad. Sci. USA 95: 10797-10802. Khare, M., M. Rodriguez, C. S. David. 2003. HLA class II transgenic mice authenticate restriction of myelin oligodendrocyte glycoprotein-specific immune response implicated in multiple sclerosis pathogenesis. Int. Immunol. 15: 535-546. Bristol, J. A., C. Orsini, P. Lindinger, J. Thalhamer, S. I. Abrams. 2000. Identification of a ras oncogene peptide that contains both CD4+ and CD8+ T cell epitopes in a nested configuration and elicits both T cell subset responses by peptide or DNA immunization. Cell. Immunol. 205: 73-83. Carreno, B. M., R. V. Turner, W. E. Biddison, J. E. Coligan. 1992. Overlapping epitopes that are recognized by CD8+ HLA class I-restricted and CD4+ class II-restricted cytotoxic T lymphocytes are contained within an influenza nucleoprotein peptide. J. Immunol. 148: 894-899. Van de Wal, Y., Y. M. Kooy, J. W. Drijfhout, R. Amons, F. Koning. 1996. Peptide binding characteristics of the coeliac disease-associated DQ(α1*0501, β1*0201) molecule. Immunogenetics 44: 246-253. Sollid, L. M.. 2000. Molecular basis of celiac disease. Annu. Rev. Immunol. 18: 53-81. Qiao, S. W., J. Piper, G. Haraldsen, I. Oynebraten, B. Fleckenstein, O. Molberg, C. Khosla, L. M. Sollid. 2005. Tissue transglutaminase-mediated formation and cleavage of histamine-gliadin complexes: biological effects and implications for celiac disease. J. Immunol. 174: 1657-1663. Gjertsen, H. A., K. E. Lundin, L. M. Sollid, J. A. Eriksen, E. Thorsby. 1994. T cells recognize a peptide derived from α-gliadin presented by the celiac disease-associated HLA-DQ (α1*0501, β1*0201) heterodimer. Hum. Immunol. 39: 243-252. Godkin, A. J., M. P. Davenport, A. Willis, D. P. Jewell, A. V. Hill. 1998. Use of complete eluted peptide sequence data from HLA-DR and -DQ molecules to predict T cell epitopes, and the influence of the nonbinding terminal regions of ligands in epitope selection. J. Immunol. 161: 850-858. Godkin, A., T. Friede, M. Davenport, S. Stevanovic, A. Willis, D. Jewell, A. Hill, H. G. Rammensee. 1997. Use of eluted peptide sequence data to identify the binding characteristics of peptides to the insulin-dependent diabetes susceptibility allele HLA-DQ8 (DQ 3.2). Int. Immunol. 9: 905-911. Kwok, W. W., M. L. Domeier, F. C. Raymond, P. Byers, G. T. Nepom. 1996. Allele-specific motifs characterize HLA-DQ interactions with a diabetes-associated peptide derived from glutamic acid decarboxylase. J. Immunol. 156: 2171-2177. Marinaro, M., H. F. Staats, T. Hiroi, R. J. Jackson, M. Coste, P. N. Boyaka, N. Okahashi, M. Yamamoto, H. Kiyono, H. Bluethmann, et al 1995. Mucosal adjuvant effect of cholera toxin in mice results from induction of T helper 2 (Th2) cells and IL-4. J. Immunol. 5: 4621-4629. Lavelle, E. C., E. McNeela, M. E. Armstrong, O. Leavy, S. C. Higgins, K. H. Mills. 2003. Cholera toxin promotes the induction of regulatory T cells specific for bystander antigens by modulating dendritic cell activation. J. Immunol. 171: 2384-2392. Nilsen, E. M., F. L. Jahnsen, K. E. Lundin, F. E. Johansen, O. Fausa, L. M. Sollid, J. Jahnsen, H. Scott, P. Brandtzaeg. 1998. Gluten induces an intestinal cytokine response strongly dominated by interferon γ in patients with celiac disease. Gastroenterology 115: 551-563. McMahon, E. J., S. L. Bailey, C. V. Castenada, H. Waldner, S. D. Miller. 2005. Epitope spreading initiates in the CNS in two mouse models of multiple sclerosis. Nat. Med. 11: 335-339. Klehmet, J., C. Shive, R. Guardia-Wolff, I. Petersen, E. G. Spack, B. O. Boehm, R. Weissert, T. G. Forsthuber. 2004. T cell epitope spreading to myelin oligodendrocyte glycoprotein in HLA-DR4 transgenic mice during experimental autoimmune encephalomyelitis. Clin. Immunol. 111: 53-60. Ott, P. A., M. T. Dittrich, B. A. Herzog, R. Guerkov, P. A. Gottlieb, A. L. Putnam, I. Durinovic-Bello, B. O. Boehm, M. Tary-Lehmann, P. V. Lehmann. 2004. T cells recognize multiple GAD65 and proinsulin epitopes in human type 1 diabetes, suggesting determinant spreading. J. Clin. Immunol. 24: 327-339. Veeraraghavan, S., E. A. Renzoni, H. Jeal, M. Jones, J. Hammer, A. U. Wells, C. M. Black, K. I. Welsh, R. M. du Bois. 2004. Mapping of the immunodominant T cell epitopes of the protein topoisomerase I. Ann. Rheum. Dis. 63: 982-987. Zuercher, A. W., S. E. Coffin, M. C. Thurnheer, P. Fundova, J. J. Cebra. 2002. Nasal-associated lymphoid tissue is a mucosal inductive site for virus-specific humoral and cellular immune responses. J. Immunol. 168: 1796-1803. Prakken, B. J., R. van der Zee, S. M. Anderton, P. J. van Kooten, W. Kuis, W. van Eden. 1997. Peptide-induced nasal tolerance for a mycobacterial heat shock protein 60 T cell epitope in rats suppresses both adjuvant arthritis and nonmicrobially induced experimental arthritis. Proc. Natl. Acad. Sci. USA 94: 3284-3289. Rossi, M., F. Maurano, N. Caputo, S. Auricchio, A. Sette, R. Capparelli, R. Troncone. 1999. Intravenous or intranasal administration of gliadin is able to down-regulate the specific immune response in mice. Scand. J. Immunol. 50: 177-182.